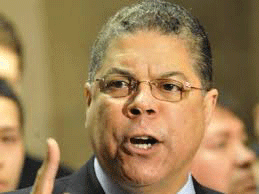 On Wednesday, Oct. 31st, 2018, the Chicago City Council adopted a resolution by Alderman Roberto Maldonado that proclaims the area of Division Street between Western and Grand as Puerto Rico Town. This resolution calls for a state mandate that would designate this corridor along Division St. as a “Special Purpose District” that would establish a “Cultural Sanctuary.” This designation initiates a process that prioritizes municipal investments in existing and new businesses, and arts and culture that will preserve the community’s unique identity and create jobs and a strong economy. The Resolution described the most important facts and statements that made Puerto Rican Town a reality. 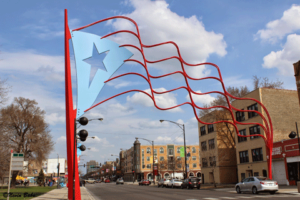 It is in Chicago’s “Little Puerto Rico” known as Paseo Boricua, where visitors can experience a full immersion into Puerto Rican culture including authentic food, music, art, and the Spanish language. In 1995, the City installed the world’s largest piece of public art depicting rippling steel Puerto Rican flags as the welcoming gateways to Paseo Boricua. They stand as a true symbol of strength to the thousands of Puerto Rican evacuees who sought shelter in Chicago after Hurricane Maria. 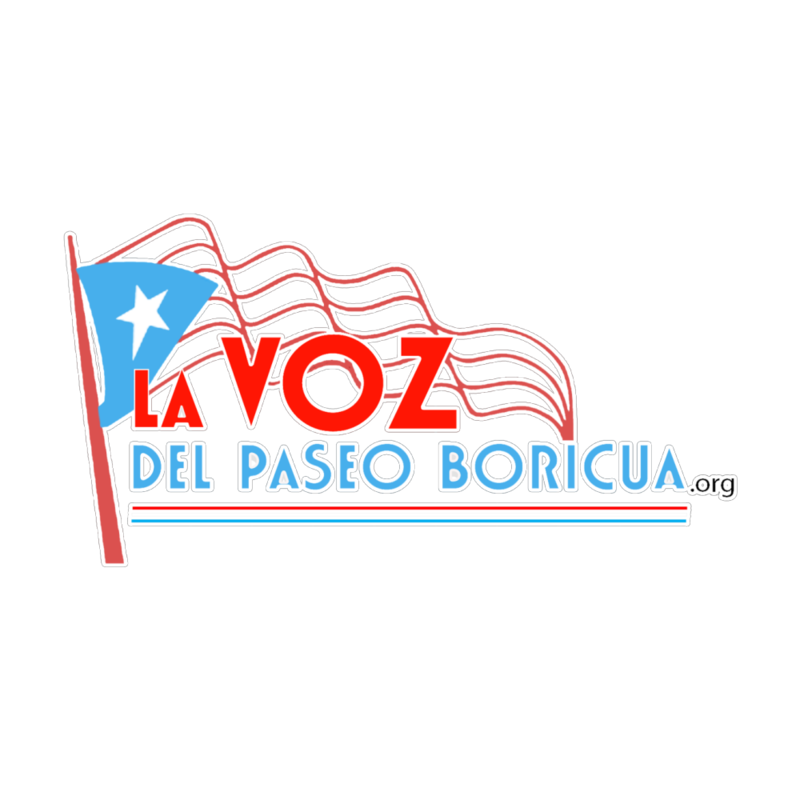 The 2010 Census counted approximately 102,703 Puerto Ricans living in the neighborhoods surrounding Paseo Boricua, the third largest Puerto Rican population in the continental United States. However, Humboldt Park is on the cusp of major changes where the cultural integrity of the community is being heavily challenged by the process of gentrification, which calls for the “need to find a true balance between economic growth and preservation of neighborhood character and affordability” according to a Tribune editorial April 9, 2018. Being proclaimed Puerto Rico Town supports community efforts to fight gentrification and maintain the heritage of the diaspora. Paseo Boricua features one of the largest collections of public art in the country including murals, the Paseo Walk of Fame, light poles depicting Puerto Rican iconic images, and the recently installed Las Puertas de Paseo Boricua, a collection of sixteen unique doors painted by artists reminiscent of the vibrant doors found in Old San Juan. The neighborhood is home to several esteemed cultural centers including the National Museum of Puerto Rican Arts and Culture, the only Puerto Rican Museum in the country, completely dedicated to the preservation and perpetuation of Puerto Rican History; the PRCC’s Vida SIDA, a community based health center focusing on AIDS prevention as well as servicing the health needs of the LGBTQ community; and the AfriCaribe Cultural Center, which showcases the Afro-Caribbean music and traditions of Puerto Rico. 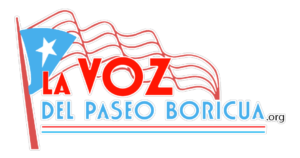 Paseo Boricua will soon house the Nancy Franco-Maldonado Paseo Boricua Arts Building providing housing, business opportunities, and commercial spaces for community artists to live and work. Last but not least, Urban Theater Company, the only Puerto Rican founded theater in Chicago, featuring award-winning productions, will also be house in the Arts Building. 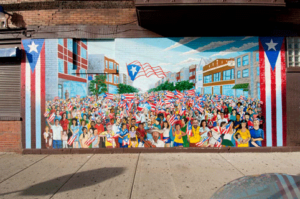 The Puerto Rican community celebrates its pride in its leaders through historical markers in and around the Paseo Boricua including a tiled mosaic and high school named after famous Puerto Rican baseball player Roberto Clemente; schools named after Jose de Diego, Puerto Rican patriot and poet; and another Independence leader and Harvard educated attorney, Pedro Albizu Campos; a street through Humboldt Park named after Bronze Star Medal awardee and community activist, Oscar Lopez Rivera; and another street through Humboldt Park named after modern day Puerto Rican baseball star, Javy Baez; the PRCC Child / Parent Center named after the renoun Puerto Rican poet, educator and pianist Consuelo Lee Corretjer and Chicago’s very own beloved native daughter activist and late wife of current Alderman Roberto Maldonado, Nancy Y. Franco-Maldonado. The town would not be complete without one of the largest faith based institutions, New Life Covenant Church, which has now anchored itself on Division and Kimball providing needed social services under its logo “A Church for the Hurting” and it is led by Pastor Wilfredo “Choco” De Jesus, a native son of Humboldt Park who was selected by Times Magazine as one of 100 most influential people. In the area of Public Health, Norwegian American Hospital, which is now in the process of developing an innovative Community Development and Wellness District, adds new economic vibrancy to the community. Division Street (known to Puerto Ricans as “La Division”), has been the setting for Chicago’s literary tradition including Stud Terkel’s Division Street USA, Saul Bellow’s The Adventures of Augie March, and Humboldt’s Gift, Nelson Algren’s Man with the Golden Arm, and more recently Puerto Rican writers like Salima Rivera, David Hernández, Johanny Vázquez, and David Delgado. Given all this, it was resolved at City Council that Paseo Boricua shall be forever known, and locally, nationally, and internationally officially recognized as the City of Chicago’s “Puerto Rico Town”, thus calling upon de state legislature to designate a Special Purpose District that would constitute a “Cultural Sanctuary” and the City’s destination of choice for tourists and Chicagoans alike. Visitors “can take this passage to Puerto Rico just by boarding the #22 Division Bus to Puerto Rico Town”, explained Maldonado.